Recipes for Greek cookies include delicious voutimata (biscotti dunking cookies), sugary holiday confections, and those made with fabulous combinations of spices and nuts. The name for Koulourakia comes from their round twisted shape but you will also see them shaped as small braids or in the shape of the letter “S.” Kids will love helping you shape these traditional Greek cookies. 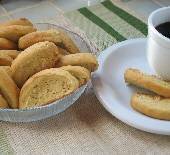 A recipe for Lenten Koulourakia that uses vegetable oil and wine to flavor the twists, and produces a crisp and delicious cookie that is perfect for dunking in coffee. These buttery twists are the traditional cookie of Greek Easter. They can be twisted and shaped in many ways and often will have a bright red egg as decoration. The traditional fat used in Greek cooking is olive oil, and today, with what we know about “good fats” and “bad fats,” making sweets with olive oil is a healthy choice – and taste is not sacrificed! Though the name is hard to pronounce, Melomakarona (meh-loh-mah-KAH-roh-nah) are delicious and not very hard to make. Also known as Finikia (fee-NEE-kya), these are traditionally enjoyed during the Christmas and New Year’s holiday, but you can certainly enjoy them year round. Baking during the Lenten season can be a challenge when you are abstaining from key ingredients like butter and eggs. These tasty biscotti are made with “Lenten-approved” ingredients and are wonderful with coffee. These cookies are loaded with almonds, which make up most of the cookie dough. The recipe is quick and calls for self-rising flour. These wreath-shaped no-butter sesame yeast cookies are a Christmas tradition on the Greek island of Crete, and are made once a year. Tastes of orange, lemon, and tangerine combine in this traditional Greek cookie that’s perfect with coffee or tea, or as a snack. These are not very sweet, and the recipe has no butter or eggs. Grape molasses (“petimezi”) is a sweetener that dates back to the Bronze Age. Buy it or make it at home to create these delicious cookies. These little cookies can be formed into various shapes: circles, figure eights, braids, or other shapes. The key is to keep them small. 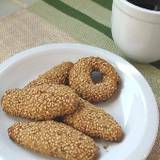 These delicious small sesame cookies can be found all over Greece, in bakeries and at home. They are made without butter and eggs and can be stored for up to two months. These small twice-baked cookies are slightly sweet rusks (biscotti), and a traditional Greek favorite for dunking in coffee, tea, or milk. This recipe has no butter or eggs. A dusting of confectioner’s sugar on fabulous walnut-rich cookies are just big enough for a delicious mouthful. Easy to make, these cookies are autumn and winter favorites. These traditional cookies are made with ouzo, anise, and coriander, to give them a classic Greek taste. The dairy-free recipe is easy to make and fun for kids to form the customary shapes. These delicious spice cookies are perfect for dunking. They’re made with no eggs, and with oil rather than butter, and are fun for kids to shape into rings, spirals, and shapes from their imaginations.